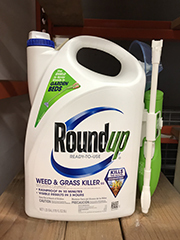 A jury reached a verdict of $289+ Million on Friday in a liability trial in San Francisco against Monsanto for the alleged carcinogenic propensities of its popular herbicide RoundUp. The claim was brought on behalf of a school groundskeeper who is suffering from terminal cancer. He alleged that his exposure to the glyphosate-based herbicide caused his illness, non-Hodgkin’s lymphoma. The case is one of 5,000 that are now being cued-up for trial. The case mirrors the trajectory of asbestos exposure claims, the longest run tort in US history. The initial two liability cases, brought against the manufacturers, suppliers, and distributors of asbestos fiber in the 1970’s, trigged a mass onslaught of workers’ compensation cases on a national basis. Glyphosate, N-(phosphonomethyl) glycine, is one of the most widely used herbicides. It is the active ingredient in products such as Roundup, Rodeo Aquatic Herbicide, and Eraser. Glyphosate is a broad-spectrum herbicide that is used on broadleaf weeds, grasses, and woody plants. The chemical was approved for use as a weed killer in 1974 and sold by Monsanto Co. Monsanto was subsequently acquired by Bayer AG. The outcome of either the State and Federal Court glyphosate liability action, the ramifications in workers’ compensation claims remain uncertain. Since the standard of proof in workers’ compensation actions is based on an administrative law system, glyphosate claims may begin to emerge as the next wave of serious occupational exposure claims.